The era of Ancient Egypt history, which includes the time span of First Intermediate Period, stretches over 3000 years and encompasses hundreds of Pharaohs. It was a period after the Old Kingdom when Egypt was not ruled by a single government. It lasted between 110 and 200 years depending on which sources one trusts. The Old Kingdom appears to have ended towards the end of the 6th Dynasty, and the Middle Kingdom was founded when Upper and Lower Egypt were reunited during the 11th Dynasty: I will restrict the discussions to this period. When Pepi II died, the authority of the central government broke down and the unity of Upper and Lower Egypt crumbled. 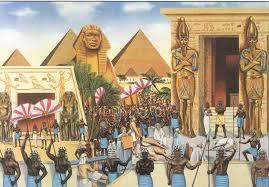 Manetho claims that the Seventh Dynasty was composed of seventy Kings who ruled for seventy days. There is no evidence to support this unlikely situation, and it is generally thought that the statistic was not exact but instead used to express the chaotic nature of the period. The 1st Intermediate Period is often characterized as chaotic and miserable, with degraded art — a dark age. Barbara Bell hypothesized that the 1st Intermediate period was brought about by a prolonged failure of the annual Nile floods, leading to famine and collapse of the monarchy. The 1st Intermediate Period also marks a wider spread of the Pharaonic culture throughout the country. During the Early Dynastic Period and the Old Kingdom, the typical Pharaonic culture had been limited to the royal court and the elite surrounding it. The 6th Dynasty policy of using local governors to increase the hold of the central government in the entire country started a process that would establish the Pharaonic culture beyond the royal court. During the 1st Intermediate Period, cartonnage was developed. Cartonnage is the word for the gypsum and linen colored mask that covered the face of a mummy. Earlier, only the elite had been buried with specialized funerary goods. During the 1st Intermediate Period, more people were buried with such specialized products. This indicates that the provincial areas could afford non-functional craftsmen, something that only the pharaonic capital had done before. However, no more pyramids were built. Literary sources describe a time of anarchy, with noblemen and noblewomen working in the fields, men killing their parents, brothers fighting, and tombs were destroyed. Some people, like Brian Fagan, think this may have been brought on by a major climate change which brought drought conditions to Egypt. Tomb inscriptions stress the independence of the individual, sometimes referring to local conflict. The use of funerary symbols and concepts previously reserved for the king shows that members of the élite could hope to reach the afterlife.